Pun intended. I've been focusing on fairing both the cockpit and the rudder in my spare time over the past two days. In the race to get to overall fairness though, the rudder won. Well, one side at least. 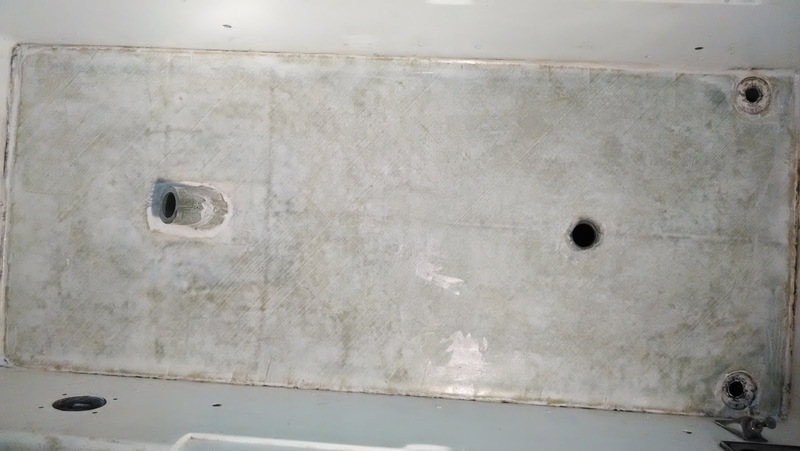 After laying up the final big piece of cloth in the cockpit a few days back, I quickly got the first round of fairing compound on, but the weather turned very humid later that day and I found that it caused the epoxy to create a huge amount of amine blush on the surface. At first I thought the epoxy wasn't curing properly, but upon closer inspection, I found that the epoxy had cured and was quite hard, but the blush was thick and waxy, making it seem as if the fairing was still soft and uncured. I googled it, and sure enough, the production of amine blush is related to ambient humidity. Anyway, this slowed me down a bit, because I had to carefully wash the whole cockpit down without letting water get into the fuel filler port in the middle (the tank is sealed off, but I don't really want to pour water all over it and the engine). After letting that dry, I sanded the whole deck down, mixed up another batch of fairing compound and troweled it out. The deck itself was already in good shape, I just have to fill in the 1708 weave pattern, but the edges where it meets the sides of the deck need plenty of smoothing. That's where I put most of the fairing compound; initially I used a tongue depressor, and ended up using my finger (with gloves). I had zero time yesterday to get back to the boat but I did put on the second (and maybe final) coat of fairing compound on the rudder. For the rudder I am using System Three Quick Fair mainly because it's convenient and easy to use. 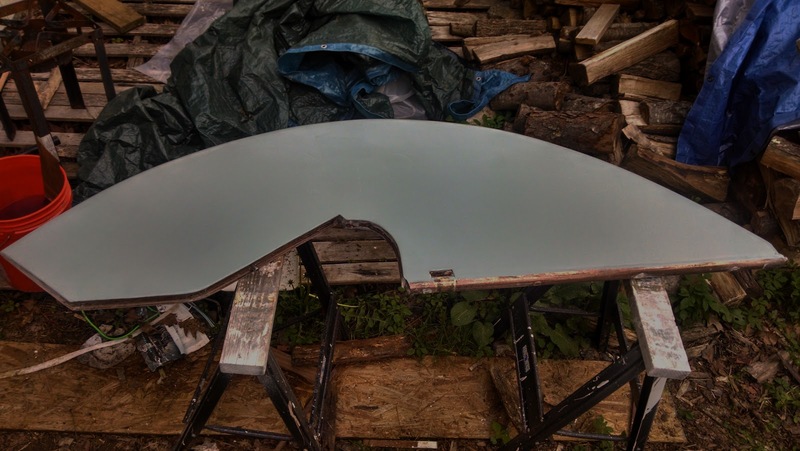 I plan on using it for the final fairing coat on the deck as well, but I might have to order another quart because I'm using more than I expected for the rudder project. 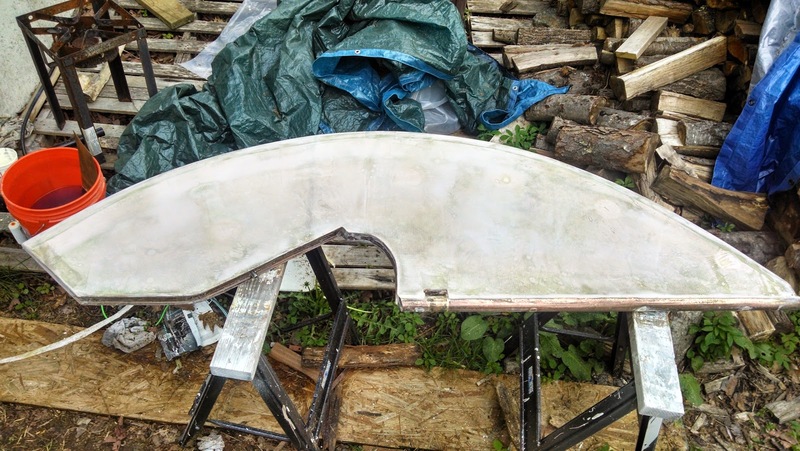 This afternoon, the humid, rainy weather broke so I took the opportunity to take the rudder outside to sand it all down again (I had done the same thing on the first round of fairing). 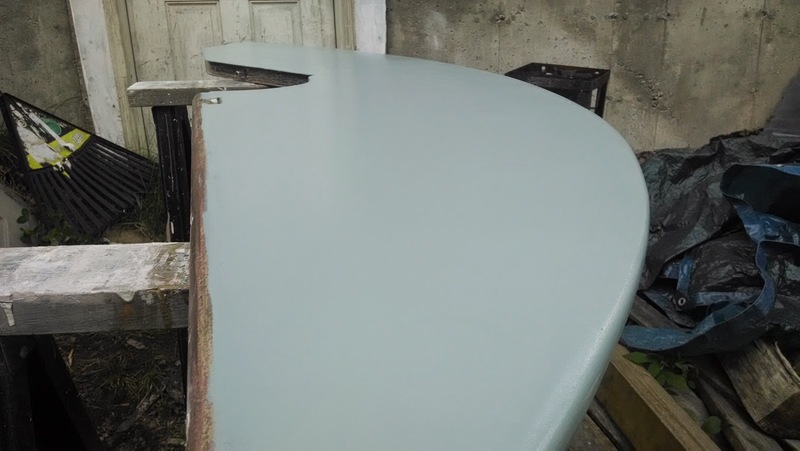 I got it to the point where I thought it was fair, but it's hard to tell from touch alone, and the color on the rudder was very irregular from all the work done on it, so I decided I'd put on some epoxy primer to get the color uniform and make it easy to spot high spots.